Aqua and Pig’s relationship is more than just Sun sign compatibility of Cancer and Aquarius. No individual is a pure Cancer or Aquarius but instead is a unique combination of signs and planets. The following interpretation defines the synastry or interplanetary aspects between the planets in Pig’s birth chart and the planets in Aqua’s birth chart. There is no evil planet in the combinations. No single combination can make or break the relationship. The list goes from the most harmonious (positive) to the most discordant (negative). Pig’s Jupiter Trines Aqua’s Neptune (+12.05 harmony) – Pig’s sense of growth, expansion, or generosity combines very effortlessly with Aqua’s sense of spirituality, imagination, or mystical inclination. 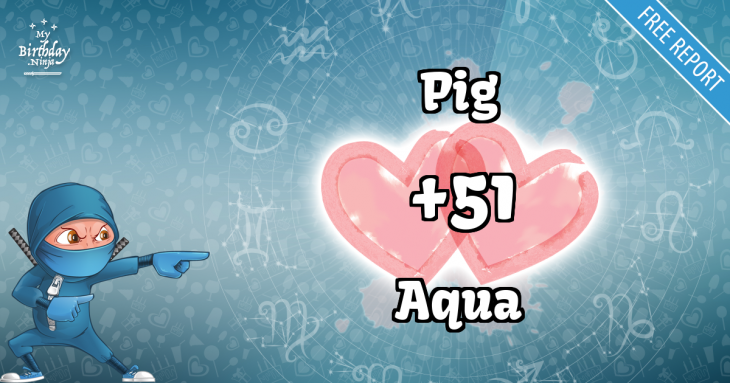 Pig’s expansive dreams are in harmony with Aqua’s intuitions. Both are spiritually compatible. The relationship encourages idealism and charitable instincts in each other. Aqua’s Venus Sextiles Pig’s Jupiter (+11.61 harmony) – Aqua’s sense of sexuality, attraction, or intimacy combines pleasantly with Pig’s spirit of growth, expansion, or generosity. Both enjoy the same pastimes, cultural activities, and other forms of entertainment. There is natural stimulation in the relationship that brings out good qualities like optimism and self-confidence in each other. Pig’s Sun Trines Aqua’s Jupiter (+10.86 harmony) – Pig’s sense of identity, ego, will, and character combine very effortlessly with Aqua’s spirit of growth, expansion, or generosity. There is harmony in Pig and Aqua’s goal of expanding their horizons. There are much optimism and enthusiasm in the relationship. Pig inspires Aqua to plan big dreams. Aqua will make Pig feel terrific. This aspect helps bring good luck and financial success in a business partnership. Aqua’s Mercury Sextiles Pig’s Jupiter (+9.08 harmony) – Aqua’s mentality and powers of perception combine pleasantly with Pig’s sense of growth, expansion, or generosity. Wit and humor are abundant in the relationship. Exchange of ideas is enthusiastic and friendly. Aqua’s ideas stimulate Pig’s dreams. Pig’s faith deepens Aqua’s intellectual self-confidence. Pig sympathizes with Aqua’s desire for mental advancement. Aqua respects the moral, spiritual, and intellectual abilities of Pig. Pig’s Moon Trines Aqua’s Mercury (+9.00 harmony) – Pig’s emotional needs combine very effortlessly with Aqua’s mentality and powers of perception. There is harmony in the intuitive knowledge of each other’s ideas and views. The relationship facilitates good communication and understanding. Both have many similar interests and encourage each other’s mental development. Aqua and Pig are often in complete agreement with each other. Sometimes they can interpret each other’s dreams. Aqua’s Jupiter Trines Pig’s Neptune (+8.86 harmony) – Aqua’s sense of growth, expansion, or generosity combines very effortlessly with Pig’s sense of spirituality, imagination, or mystical inclination. Aqua’s expansive dreams are in harmony with Pig’s intuitions. Both are spiritually compatible. The relationship encourages idealism and charitable instincts in each other. Pig’s Mercury Trines Aqua’s Jupiter (+8.40 harmony) – Pig’s mentality and powers of perception combine very effortlessly with Aqua’s sense of growth, expansion, or generosity. Wit and humor are abundant in the relationship. Exchange of ideas is enthusiastic and friendly. Pig’s thoughts are in harmony with Aqua’s dreams. Aqua’s faith deepens Pig’s intellectual self-confidence. Aqua sympathizes with Pig’s desire for mental advancement. Pig respects the moral, spiritual, and intellectual abilities of Aqua. Aqua’s Moon Trines Pig’s Mercury (+7.46 harmony) – Aqua’s emotional needs combine very effortlessly with Pig’s mentality and powers of perception. There is harmony in the intuitive knowledge of each other’s ideas and views. The relationship facilitates good communication and understanding. Both have many similar interests and encourage each other’s mental development. Pig and Aqua are often in complete agreement with each other. Sometimes they can interpret each other’s dreams. Pig’s Moon Trines Aqua’s Venus (+6.78 harmony) – Pig’s emotional needs combine very effortlessly with Aqua’s sense of sexuality, attraction, or intimacy. There is harmony in the deep mutual devotion and affection in each other. Aqua’s cuteness charms Pig’s soul. Both are in agreement on creative undertakings and social engagements. Pig and Aqua can easily forgive each other on minor conflicts. This aspect boosts a strong physical attraction for love and marriage. Aqua’s Venus Trines Pig’s Pluto (+5.83 harmony) – Aqua’s sense of sexuality, attraction, or intimacy combines very effortlessly with Pig’s sense of transformation, change, or power and destiny. There is harmony when both enjoy moving forward and growing through the relationship. There are feelings of relief and enlightenment after a relationship challenge. The magnetic attraction between Aqua and Pig makes it impossible to separate them permanently. Aqua’s Mars Trines Pig’s Pluto (+5.39 harmony) – Aqua’s sexual drive, temper, and powers of self-assertion combine very effortlessly with Pig’s sense of transformation, change, or power and destiny. There is an impressive harmony between Aqua and Pig. Both can strengthen each other’s willpower to tackle any large-scale projects together. This aspect is perfect for a business partnership. Aqua’s Mercury Trines Pig’s Pluto (+5.08 harmony) – Aqua’s mentality and powers of perception combine very effortlessly with Pig’s sense of transformation, change, or power and destiny. There is harmony in how each other influence the other’s mind. There are depth and wisdom in the relationship. Pig encourages Aqua to think more deeply. When both Aqua and Pig combine their minds, they can build their exciting ideas into a giant success. Pig’s Moon Sextiles Aqua’s Jupiter (+4.65 harmony) – Pig’s emotional needs combine pleasantly with Aqua’s sense of growth, expansion, or generosity. Both stimulate optimism and make each other feel positively wonderful. There’s plenty of opportunities for growth in the relationship. Aqua is patient, tolerant, protective, and will not hold any ill-will toward Pig. Pig inspires and encourages Aqua’s broad goals. This aspect is conducive to fertility and childbearing if the wife’s health and age can support it. There’s a sense of luck and financial benefits from Aqua to Pig. Pig’s Sun Trines Aqua’s Moon (+4.30 harmony) – Pig’s sense of identity, ego, will, and character combine very effortlessly with Aqua’s emotional needs. Aqua’s sensitive nature and Pig’s personality are in harmony. Aqua inspires and gives comfort to Pig. Pig supports, encourages, and revitalizes Aqua. This is a favorable aspect of marriage. Pig’s Moon Sextiles Aqua’s Neptune (+4.03 harmony) – Pig’s emotional needs combine pleasantly with Aqua’s sense of spirituality, imagination, or mystical inclination. The relationship stimulates mutual inspiration and devotion to each other. Telepathic communication with each other is possible. Both Pig and Aqua have an affinity in mystical, esoteric, or even occult studies. There is a minor irritation when both seem distant or aloof to the other. Pig’s Jupiter Sextiles Aqua’s Pluto (+3.61 harmony) – Pig’s sense of growth, expansion, or generosity combines pleasantly with Aqua’s sense of transformation, change, or power and destiny. There is potential to build large-scale projects together. The relationship stimulates individual growth process and searches for meaning in life. Aqua’s Moon Trines Pig’s Neptune (+2.97 harmony) – Aqua’s emotional needs combine very effortlessly with Pig’s sense of spirituality, imagination, or mystical inclination. There is harmony in the mutual inspiration and devotion to each other. A robust psychic connection exists between Aqua and Pig. There is a minor irritation when both seem distant or aloof to the other. Both have an affinity in mystical, esoteric, or even occult studies. Aqua’s Moon Trines Pig’s Venus (+2.80 harmony) – Aqua’s emotional needs combine very effortlessly with Pig’s sense of sexuality, attraction, or intimacy. There is harmony in the deep mutual devotion and affection in each other. Pig’s cuteness charms Aqua’s soul. Both are in agreement on creative undertakings and social engagements. Aqua and Pig can easily forgive each other on minor conflicts. This aspect boosts a strong physical attraction for love and marriage. Pig’s Moon Trines Aqua’s Mars (+2.17 harmony) – Pig’s emotional needs combine very effortlessly with Aqua’s sexual drive, temper, and powers of self-assertion. There is harmony in the physical intimacy and irresistible attraction between Pig and Aqua. Pig inspires the development of Aqua’s sexual fire. Aqua stimulates Pig’s imagination and self-confidence. This aspect encourages reproduction if Aqua is male and Pig is female. Pig’s Jupiter Conjuncts Aqua’s Jupiter (+2.16 harmony) – The individual sense of growth, expansion, or generosity combines with ease within the couple. Pig and Aqua’s ideals and beliefs are aligned. Both appreciate each other’s good qualities. Learning and education are essential in the relationship. The relationship encourages optimism, self-confidence, and humor. Pig’s Sun Sextiles Aqua’s Mars (+2.07 harmony) – Pig’s sense of identity, ego, will, and character combine pleasantly with Aqua’s sexual drive, temper, and powers of self-assertion. The relationship stimulates each other’s self-confidence, energy, and enthusiasm. There is mutual growth, and both enjoy activities together or working toward a common goal. There is natural energy between Pig and Aqua. Pig’s Sun Sextiles Aqua’s Pluto (+1.33 harmony) – Pig’s sense of identity, ego, will, and character combine pleasantly with Aqua’s sense of transformation, change, or power and destiny. The relationship stimulates growth through unity and involves a lot of alterations. They are active in exploring each other’s deepest fears, desires, and motives. There is mutual enjoyment in exchanging ideas and solving mysteries together. Pig can bring out the psychoanalyst in Aqua. Pig’s Mars Trines Aqua’s Mars (+1.31 harmony) – The individual sexual drive, temper, and powers of self-assertion combine very comfortably between the couple. There is harmony in the desires and dreams of Pig and Aqua. The relationship is encouraging to achieve each other’s goals and ambitions. Aqua and Pig are incredibly attracted to each other and are sexually compatible. Aqua’s Mars Sextiles Pig’s Neptune (+0.81 harmony) – Aqua’s sexual drive, temper, and powers of self-assertion combine pleasantly with Pig’s sense of spirituality, imagination, or mystical inclination. The initiative of Aqua stimulates the sacrificial tendency in Pig. Aqua and Pig will support each other to a significant degree, both emotionally and creatively. Pig’s Moon Sextiles Aqua’s Moon (+0.16 harmony) – The couple’s individual emotional needs combine pleasantly. Pig and Aqua’s attitudes are similar enough they tend to agree on almost anything under the sun. They stimulate each other so well they can resolve various lifestyle problems before they even pop up. This is an excellent booster if there are conflicts in other areas of the relationship. One of the best aspects to have in a long-term relationship. Aqua’s Moon Conjuncts Pig’s Jupiter (+0.11 harmony) – Aqua’s emotional needs combine with Pig’s sense of growth, expansion, or generosity. The fusion encourages mutual confidence and respect in each other. Pig can be protective of Aqua and can be too indulgent at the same time. Aqua inspires and promotes Pig’s expansive aspirations. Even when things go wrong, Pig will not harbor any ill feelings toward Aqua. There’s a sense of luck and financial benefits from Pig to Aqua. This aspect is conducive to fertility and childbearing if the wife’s health and age can support it. Aqua’s Venus Trines Pig’s Mars (+0.09 harmony) – Aqua’s sense of sexuality, attraction, or intimacy combines very effortlessly with Pig’s sexual drive, temper, and powers of self-assertion. There is harmony in the desire of Pig and loving nature of Aqua. Both are strongly attracted to each other. This aspect is favorable in marriage and offers a fulfilling relationship. Aqua’s Neptune Sextiles Pig’s Pluto (+0.06 harmony) – Aqua’s mystical or spiritual inclination combines pleasantly with Pig’s sense of transformation, change, or power and destiny. The spiritual urge of Aqua stimulates the reforming urge of Pig. Both will support and encourage each other’s spiritual enlightenment. The relationship inspires each other to meet the world with compassion and grace. Pig’s Mercury Conjuncts Aqua’s Neptune (neutral) – Pig’s mentality and powers of perception combine with Aqua’s sense of spirituality, imagination, or mystical inclination. Aqua brings out the poet and dreamer in Pig. There is a robust telepathic connection between Pig and Aqua that helps to understand each other without speaking a word. Sometimes Pig can win arguments even when it’s wrong. Pig’s Neptune Conjuncts Aqua’s Neptune (neutral) – The individual sense of spirituality, imagination, or mysticism combines with ease within the couple. Both Pig and Aqua share the same tastes in art, music, or religion. The relationship encourages positive traits of creativity and dreaminess. It also has the tendency to promote negative characteristics of laziness or indecisiveness in Pig or Aqua. Pig’s Moon Conjuncts Aqua’s Pluto (neutral) – Pig’s emotional needs combine with Aqua’s sense of transformation, change, or power and destiny. The fusion can be either very good or very bad depending on other aspects of the relationship. There is a powerful physical attraction between Aqua and Pig. Aqua expands the ideas, imagination, and viewpoints of Pig. Sometimes Pig will find Aqua to be possessive, jealous, and domineering. Pig’s Uranus Conjuncts Aqua’s Uranus (neutral) – The individual sense of independence, freedom, and originality combine with ease between the couple. Both Pig and Aqua complement each other’s individuality and independence. There is mutual appreciation in the relationship. Both bring out the eccentric side of one another. Pig’s Sun Conjuncts Aqua’s Neptune (neutral) – Pig’s sense of identity, ego, will, and character combine with Aqua’s sense of spirituality, imagination, or mystical inclination. The spiritual tie between Aqua and Pig is deep and unbreakable. The fusion of understanding, romance, dedication, sympathy, idealism, and personal sacrifice in the relationship is remarkable. Both can read each other’s mind frequently. Pig may find Aqua hard to comprehend or elusive in some way. Pig’s Pluto Conjuncts Aqua’s Pluto (neutral) – The individual sense of transformation, change, or power and destiny combine with ease within the couple. Pig and Aqua enjoy the same cultural references. Aqua and Pig have a great time talking about the good old days since both came from the same generation. Aqua’s Moon Squares Pig’s Mars (-0.41 discord) – Aqua’s emotional needs interact stressfully with Pig’s sexual drive, temper, and powers of self-assertion. There is friction when Aqua becomes indecisive when reacting to Pig’s impulsiveness. The relationship can show signs of intense physical attraction and a negatively smothering emotional reaction. Nagging, abruptness, and even refusal to calmly talk things over will be a frequent irritation in the relationship. Serious personality conflicts can exist between Aqua and Pig. Pig’s Mars Conjuncts Aqua’s Pluto (-1.51 discord) – A delicate combination of Pig’s sexual drive, temper, and powers of self-assertion with Aqua’s sense of transformation, change, or power and destiny. There is resistance to the display of authority by the other. Both can be vindictive toward each other. The relationship is extremely competitive for Pig and Aqua. Pig’s Mercury Opposes Aqua’s Venus (-1.59 discord) – Pig’s mentality and powers of perception confront and challenge Aqua’s sense of sexuality, attraction, or intimacy. There is an exciting exchange of ideas that later on can cause tension in the relationship. There may be occasional small misunderstandings between Pig and Aqua. One listening to the other is a hit or miss. Pig tends to disregard the emotional needs of Aqua. Aqua may find Pig cold and calculative. Aqua’s Sun Opposes Pig’s Venus (-2.91 discord) – Aqua’s sense of identity, ego, will, and character confront and challenge Pig’s understanding of sexuality, attraction, or intimacy. There is an attraction but also tension between Aqua’s ego and Pig’s romantic sensibilities. Both do not have the same social ideas or desires. Pig and Aqua can be emotionally confused with one another. Pig’s Moon Squares Aqua’s Uranus (-4.54 discord) – Pig’s emotional needs interact stressfully with Aqua’s sense of independence, freedom, and originality. The friction can arouse irritations between Aqua and Pig. Aqua is eccentric, inconsiderate, and unpredictable. Pig is hypersensitive and moody. Any romantic attraction can lead to an unusual relationship that may not last long unless other aspects stabilize the connection. Pig’s Saturn Conjuncts Aqua’s Saturn (-4.57 discord) – The individual sense of commitment, necessity, or duty combines with ease within the couple. Pig and Aqua share the same ideas regarding security and ambitions. Both want things to be the same way and can understand each other’s problems. This aspect can have a devitalizing effect if Pig and Aqua are a young couple who are doing the same wrong things together. Aqua’s Venus Opposes Pig’s Neptune (-4.81 discord) – Aqua’s sense of sexuality, attraction, or intimacy confronts and challenges Pig’s sense of spirituality, imagination, or mystical inclination. There may be a one-sided attraction between Aqua and Pig. There is likely to be a certain amount of confusion, deception, even evasion in one or both. Unfounded jealousies can cause tension and misinterpretation of each other’s attitudes toward the relationship. Aqua’s Sun Squares Pig’s Jupiter (-4.83 discord) – Aqua’s sense of identity, ego, will, and character interact stressfully with Pig’s spirit of growth, expansion, or generosity. Aqua and Pig have the tendency to encourage each other’s self-indulgence, extravagance, and recklessness. There is friction in individual ego, ambition, and belief. Both Pig and Aqua may see each other as demanding or overbearing. They expect too much from one another. Aqua’s Mars Opposes Pig’s Jupiter (-5.33 discord) – Aqua’s sexual drive, temper, and powers of self-assertion confront and challenge Pig’s sense of growth, expansion, or generosity. Aqua is rash and aggressive while Pig can be overly optimistic. There is a tendency of rivalry between Aqua and Pig. There is tension in individual ambitions. Pig’s Mercury Opposes Aqua’s Mercury (-6.70 discord) – The individual mentality and powers of perception confront or challenge each other. Differences in points of view can cause tension and misunderstanding. Both have a different method of solving problems. Agreeing with each other can be difficult. Pig’s Mercury Opposes Aqua’s Saturn (-7.75 discord) – Pig’s mentality and powers of perception confront and challenge Aqua’s sense of commitment, necessity, or duty. There is tension in Aqua’s criticism and disapproval of Pig’s achievements. Pig may seem careless and annoying to Aqua. Aqua may appear cold and bossy to Pig. The tension in the relationship can be a challenge to help each other grow in wisdom. Pig’s Sun Opposes Aqua’s Venus (-8.24 discord) – Pig’s sense of identity, ego, will, and character confront and challenge Aqua’s understanding of sexuality, attraction, or intimacy. There is an attraction but also tension between Pig’s ego and Aqua’s romantic sensibilities. Both do not have the same social ideas or desires. Aqua and Pig can be emotionally confused with one another. Aqua’s Mercury Opposes Pig’s Neptune (-13.19 discord) – Aqua’s mentality and powers of perception confront and challenge Pig’s sense of spirituality, imagination, or mystical inclination. Aqua’s thinking can be overwhelmed by the wrong ideas of Pig. Lies and misunderstandings are frequent tension in the relationship. Pig may find Aqua’s method of thinking too logical or rigid. Aqua’s Sun Conjuncts Pig’s Saturn (-13.68 discord) – Aqua’s sense of identity, ego, will, and character combine with Pig’s sense of commitment, necessity, or duty. A sense of duty and responsibility weigh heavily in the relationship. Pig has the tendency to criticize and judge Aqua’s actions. Pig sometimes blames Aqua when something goes wrong. Aqua is more tolerant and forgiving towards Pig. Aqua can learn needed lessons of discipline and patience from Pig. Pig’s Sun Opposes Aqua’s Mercury (-13.86 discord) – Pig’s sense of identity, ego, will, and character confront and challenge Aqua’s mentality and powers of perception. There is tension in the differing viewpoints and opinions of Pig and Aqua. Communication between Aqua and Pig is difficult. The mental energies of Aqua are frequently opposed by the creative powers of Pig. This aspect is challenging in a long-term relationship like marriage. Pig’s Venus Opposes Aqua’s Saturn (-14.08 discord) – Pig’s sense of sexuality, attraction, or intimacy confronts and challenges Aqua’s sense of commitment, necessity, or duty. There is tension in the controlling nature of Aqua and the affectionate nature of Pig. Pig feels dominated. Aqua tends to impose too much responsibility on Pig. Aqua’s Mars Squares Pig’s Saturn (-15.46 discord) – Aqua’s sexual drive, temper, and powers of self-assertion interact stressfully with Pig’s sense of commitment, necessity, or duty. There is friction in Pig’s constructive ideas and Aqua’s enthusiasm. Pig may have unreasonable demands for Aqua. This makes Aqua impatient, angry, and defiant. The relationship has many problems of adjustment. There are 7 mutual receptions in Pig and Aqua’s planet combinations. Planets in mutual reception enhance each other. This will add +70 harmony to the total score. The remaining -28.57 discord is due to some minor aspects or planets in parallel. This is only a quick assessment of the relationship compatibility between Pig and Aqua. If both place and time of births are known, an in-depth interpretation is available in the Star Lovers Report. Try a free sample with no obligation to buy. Ssshhh! Pig, don’t let Aqua know. You are most compatible with a person born on September 11, 2000. You have a whooping birthday love match score of +171 with that person. Check it out and imagine what it feels like to be with your soul mate.